I read a wonderful article on Yahoo! 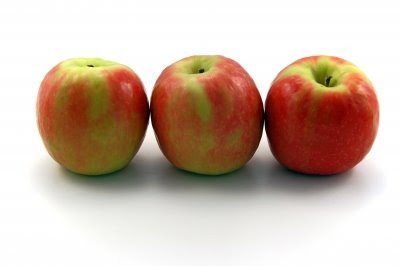 Health recently about the health benefits of apples called "Apples: The Live Longer Fruit". Now, like most people I'm familiar with the old adage of "an apple a day keeps the doctor away..." but when I learned that saying I was five - I was definitely not as conscious about what I was putting in my body as I am today. So, why are apples so good for us? Well, there are many reasons! What I learned in the article is that apples are a great source of fiber in the form of pectin, as well as a great source of antioxidants. The fiber helps cleanse our bowels and encourages good colon heath. Apples are also believed to help lower your bad cholesterol, reduce the risk of cancer, slow down our aging (my favorite benefit!) by lessening the effects of stress, diabetes, and heart disease, and help prevent hair loss. I looked up apples in a few other places and also learned that apples (and pears actually) are incredibly detoxifying, good for your skin, and help the body resist infection. Most importantly, I learned that it is important to buy apples that are organic, unbruised & firm-skinned (as to avoid the ones that were picked before they were ripe, which means they didn't develop as much nutritional value). If all of this is true, then apples really are a "miracle" fruit! Some fun ways to eat apples include: integrating them into a sandwich for some crunch, eating them on a salad (fruit or regular salad), eating low calorie dried or low calorie freeze-dried apples, eating applesauce for dessert (I'll blog about my favorite soon), or eating some apples accompanied by peanut butter, honey, low calorie frozen yogurt, fage yogurt, or low calorie ice cream! On another totally random note (I will return to my regular blog programming tomorrow), I thought this site about what 200 calories of various foods look like was really interesting/cool. It is amazing how much of some foods that you can eat for 200 calories vs. how little of others. 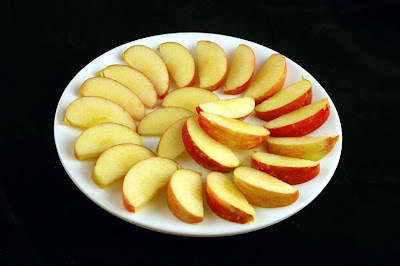 The picture to the left shows a 200 calorie portion of apples. Seems like a lot! Pretty good compared to the high sugar foods like gummy bears! I do love apples! I frequently eat them as a side to my yogurt. Interesting post. There's a saying that an apple a day keeps the doctors away.